There are signs that the global economy is slowing down. This week, Shipping rates1 from Asia to Northern Europe fell by 25% last week. The stock market in China had sharp falls2. Europe is still wrangling its hand over the Greek bailout and the American economy is starting to get worried because who needs American Dollars to trade with. The IMF3 has been predicting a rout in US stock prices and a decade-long rut for the global economy. What does this means for IT Infrastructure and Networking specifically ? What can you do to make the most of the time when capital is limited, deployments stop happening and you need to improve efficiency. The global economy outlook isn’t good, markets are nervous and signs of widespread slowdown are everywhere. Global companies feel global impacts. Slowdowns in Asia are particularly damaging to as vendor profits and growth was predicted last year. Action: Delay your spending and fight harder and expect to get discounts and deals. Start planning upgrades and maintenance that will sweat the assets and generate savings for your employer. If the global economy continues its decline then IT customers will stop investing in infrastructure as budgets shrink. Vendors will get increasingly desperate/keen to maintain sales volume, to clear stock in the warehouse and make their numbers. 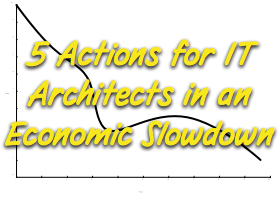 In a shrinking economy, stock reductions will improve cash flow and reduce exposure. Sacrificing profits is acceptable and reductions in selling price to close deals. On the other hand, your own employer may start cutting budgets early to pull back costs. You need to pick the moment to blow the budget before the cuts start. You will need to exercise your white collar skills to get the trigger points just right. Reducing stock reduces costs. Vendor will reduce production runs to reduce outlay and reduce warehousing costs. Distributors will reduce their stock holdings to manage cash flow. And don’t forget that spare parts inventory which will be under pressure to reduce the amount of money sitting on the shelves. Vendors often squeeze too hard on spare parts which can impact service inventory. Your own budgets are at risk of cuts as your employer will be affected to and focus will shift on sweating the capital already spent. Start thinking about upgrades instead of replacement. Look at your operational capability – it could be time to work on new processes, procedures. It might be possible to replace the endless (and mostly pointless) ITIL Project meetings with time spent on automation projects. Time to get started with the Ansible framework for task automation and start a Proof of Concept for bigger SDN projects in 3 to 5 years time. During a slowdown/recession, the middle man is always squeezed hardest and resellers may struggle to maintain their cashflow. Monitor your reseller for signs of financial stress such as invoice factoring, repeated payment requests, stressed engineers/experts with cheap laptops. In reseller-land, sales slow down but costs stay the same. There are no guarantees that an economic slow down will happen. In the last few days, the market has rebounded from a near 10% drop but remains lower of the year. The effects I discuss here will take some time, perhaps six to twelve months, to impact but its worth thinking about in advance. After all, your employers financial performance is what determines your future pay rise.